The Providence Biltmore Hotel is an upscale hotel that opened in 1922 as part of the Biltmore Hotel chain. 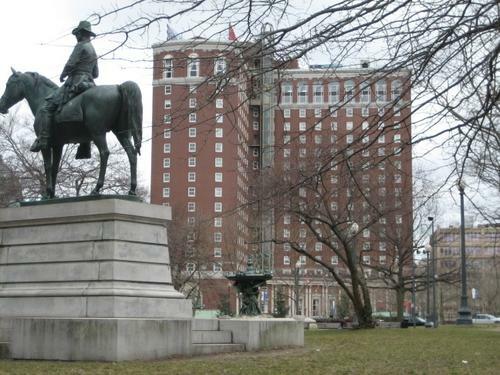 It was founded by John McEntee Bowman and Louis Wallick, and is currently owned by Grand Heritage Hotels International. It was added to the National Register of Historic Places in 1977. Built in the neo-Federal Beaux-arts style and designed by the architectural firm of Warren and Wetmore (who also designed Grand Central Station), the Biltmore was the second-tallest building in the city (after the Rhode Island State House) until the Industrial Trust Tower was finished six years later. Today, the Biltmore is the 9th-tallest building in the city. In 1954, when Providence was inundated by Hurricane Carol, much of the lobby of the Biltmore was underwater, and a plaque, eight feet up on lobby columns, commemorates the high water mark today. In 1975 the Biltmore closed and remained out of use until a group of local businesses implemented Federal tax credits to rehabilitate the building, reopening it in 1979. The Biltmore's external glass elevator which climbs all 18 floors of the hotel was added for the 1979 re-opening. The hotel was originally built with 600 rooms.